Don’t Forget a Mattress & Sheets! Pop quiz, mama: where do babies spend over 16 hours per day? Needless to say, you need one that’s safe. There are crib safety standards in place in the USA to make sure all newly-manufactured cribs are safe, but that’s not even close to a guarantee that yours will be! First of all, cribs are sometimes recalled because of safety issues. For example, a recent recall of Baby’s Dream mattresses was because of lead paint being used. Yikes. On top of that, crib safety standards are updated all the time: the last time was in 2011, where drop-side cribs were banned. This is pretty huge, and it means that many older cribs are no longer safe! So, how do you cut through all the noise and find a crib that’s safe, affordable and just plain good? That’s why I’m here to help! An awesome choice in a convertible crib is the Stork Craft Tuscany. (click here to check price on Amazon). It goes from a crib, to a toddler bed, to a day bed, to a full-size bed. It comes with the required rail to turn it into a toddler bed, but the full-sized bed rail comes separately. 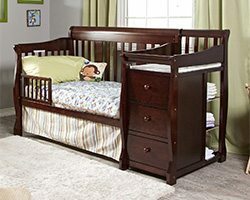 What’s great is that while this crib is pretty average in price, I think it competes well with those in the $400+ range! You might be a little nervous ordering it because it’s so cheap, but it really is a great crib and most parents who buy it agree. It really is a nice, solid, safe and sturdy crib, plus it converts into a bed later. I have to reiterate that: it’s solid. Surprisingly so, especially compared to other cribs. Plus it’s absolutely gorgeous. It’s made with real wood, not processed stuff. Unfortunately, coming with that territory sometimes means small dings in the material, but usually, they’re not very noticeable. Compared to the DaVinci Kalini, the wood is much harder, which is a good thing. 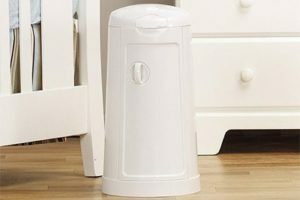 It means it won’t ding up as easily, and if your child bites it, they won’t damage it. What’s pretty cool is that the mattress height is adjustable to 3 levels, so it’s pretty great even for a short mom. When they get mobile and start to stand up on their own, you can lower it so they can’t climb up over the top. Just be warned: when you assemble this, you should do it IN the room, because it won’t fit through a standard-sized door frame. I noticed some reviews saying that the crib had a chemical smell. To me, that’s odd: this is real wood, meaning it uses a finish. It shouldn’t be dangerous; it’s just part of the manufacturing process. A good pairing of a crib mattress to go with this crib is the Sealy Soybean Core Mattress; you can read my review of it here. It fits perfectly in this crib! Want more reviews or to see the price? Just click here! An insanely popular crib! The DaVinci Kalani (click here to check price on Amazon) is great! Made of real wood, heavy and sturdy, and with no moving parts, it’s easy to tell that this is a quality crib just by looking at it. Plus it looks really lovely! It’ll look nice in any nursery, and it comes in 6 different colors to match the rest of your decor. 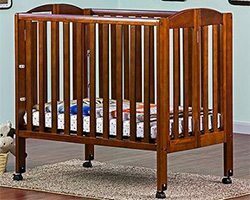 This is obviously another convertible crib, and like the Stork Craft crib, it comes with the toddler rail to convert it to a toddler bed. A nice bonus, considering they cost about $100. The full-size bed rail does come separately, though. 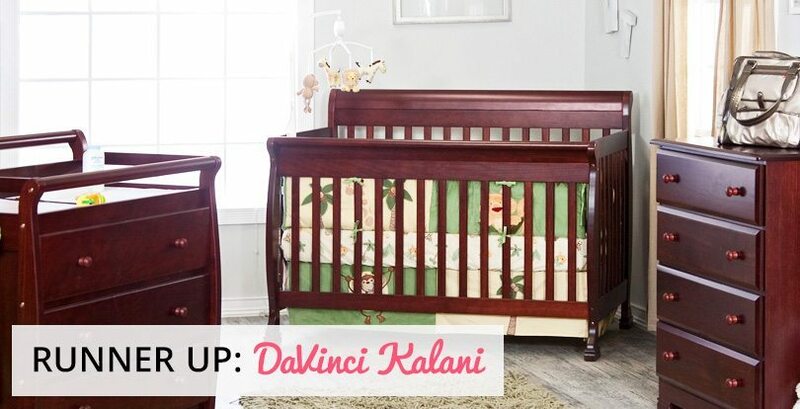 Unlike many cribs, the Kalani has a total of 4 mattress level settings, which is perfect for those of us who’re short! You just need to set it lower when they get up and about on their own 2 feet. A downside to me is that while the crib itself is pretty affordable, the accompanying furniture pieces are not. It’s hard to spend upwards of $450 for matching baby dressers. But you can probably find something that matches elsewhere. Another downside is that it seems to be made of a softer wood compared to the Stork Craft crib, making it easier to mark up and scratch. However, it shouldn’t break or have pieces come off if your child decides to bite on it. I’d recommend getting a toddler teething rail to go along with it once they start teething. Anyway, this is a pretty great crib! Highly recommended. The traditional type of crib; if you close your eyes and think of a crib, this is probably the one you’re picturing! They’re generally simple and don’t have a lot of frills; just 4 walls, but they do come with different options. If all you need is a good crib that gets the job done, going with a standard one should work! Don’t buy just any crib, though; look through the various options and styles first. These are designed to convert and grow with your baby. When they grow out of the crib, they can convert to a toddler (or even full-sized) bed so you can keep using it. Cribs that convert to full-sized beds can last until your child moves out, even! Sometimes you need to purchase separate kits to convert the crib, so you can choose to either buy it along with the crib knowing you won’t need it for a few years, or wait until you actually need it. Can transform as your child grows, sometimes even into a full-sized bed! 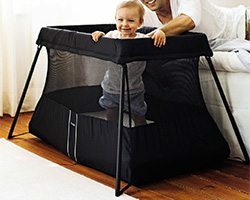 Designed for those of us who have a lack of space, travel a lot or simply don’t need to use a crib that often, portable cribs are also good option if you’ll need to move it around with ease. They usually have the ability to fold up easily, making them ideal for travel, too. 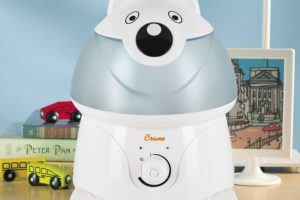 Being able to move the crib around from room-to-room also makes it possible for you to keep an eye on them at all times without having to use a baby monitor. Be sure to pay attention to the type of wheels the crib has. Depending on whether you have to roll it over carpet or floor, you’ll need to make sure you have the right type, as the floors can become scratched if you aren’t careful. Designed for those that travel, portable cribs aren’t meant to be used as a full-time crib, but are excellent if you need something that folds up into a small package to bring with you. 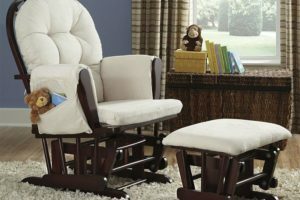 If you plan on spending a night at grandma’s house, a travel crib is a great option. Since these cribs are made of lightweight materials like aluminum and mesh, they are easy to transport, but they aren’t sturdy enough to use as a permanent crib. A convenient option is a convertible crib; one that can transform from an infant crib into a toddler bed when they outgrow it. Buying a crib is no easy task; there are a lot of different things you have to take into consideration. Before you drive to the store and start your search, here are the things you should think about first. Cribs range in price from the low $100s to over $1000, so there’s something for any price range. However, in order to make your shopping experience easier, you should set out a budget first. Going for a convertible crib may mean a higher initial investment, but the crib will last you much longer ultimately. If you’re going to be moving the crib around at all, you’re going to want one that has caster wheels to roll it around. This also makes it a lot easier to change the sheets. However, if you go this route, make sure that the wheels are able to be locked in place. Otherwise, it’s simply not safe at all once your baby starts to stand on their own. Cribs are big, and if you have a limited amount of space to put it, you need to think about that. All crib info sheets should tell you how big the assembled size is. If you have no room at all for a crib, a baby bassinet is a good alternative to use for the first few months. Is the Crib a Standard Size? 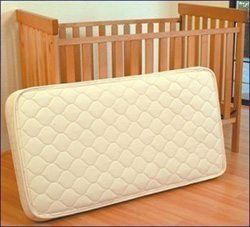 The standard baby crib size is 52 by 27.8″, and the standard crib mattresses adhere to this size. However, some cribs come in difference sizes, so if you get one of these, it’s imperative that you get a mattress that will fit it. I’d recommend just going with a crib that uses the standard size, because it’s going to be a lot easier to deal with. Does it Match The Rest of Your House? Cribs come in a variety of styles, so you should try to get one that matches the rest of your house, or at the very least, your nursery. Most cribs are made of wood, but some will be made out of metal, so keep that in mind, too. There are a lot of things to beware of when shopping for a crib that’s going to be safe. 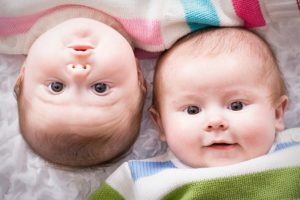 Somewhere around the age of 4-6 months, babies usually start to get their teeth. This leads to them turning into little beavers, sinking their teeth into the crib railing and using it as a teething toy. This can lead to your toddler having a mouthful of wood splinters and paint, and needless to say this is something you want to avoid! 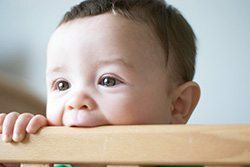 While crib manufacturers are not required to put teething rails in place, some do opt to put permanent rails in their cribs. There are also 3rd party teething rails available that you can attach to the crib, but you have to be careful with them. A particularly curious toddler can remove them with ease! Crib sleep positioners used to be a common thing to use in cribs; they’re meant to keep baby in place and sleeping on their backs. 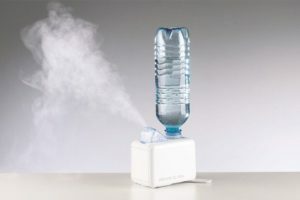 However, after several deaths were attributed to these positioners, they’re no longer manufactured in the USA and not recommended. You can read our full article on the danger of sleep positioners to see exactly why. While it’s not recommended to use a used crib, some parents still opt to do this. Maybe they have an heirloom crib that was given to them by family, or maybe it was just to save money. I wouldn’t recommend this because there are a number of things that could go wrong; it could be recalled and you don’t even know it. It could also be missing the instructions, and an improperly-assembled crib isn’t safe at all. It could be suffering from wear or damage that’s not immediately noticeable, too. Worst, it may just be an unsafe crib, period. 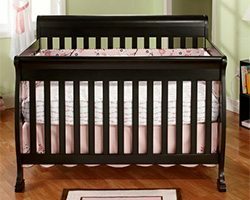 Since the safety standards changed in 2010 and drop-side cribs are no longer sold in stores, but they’re still available, especially from private sellers. If you have an older crib and can’t afford to buy a new one, please check the CPSC’s crib recall database at the very least to make sure your particular crib hasn’t been recalled. If it has been, don’t use it. In fact, if there is no sentimental value in the crib, it would be best to destroy it. Modern safety standards dictate that the distance between the slats should be no more than 2 3/8″; this is because any more can mean your child getting a limb stuck. While this isn’t a concern in newer cribs, older ones may have this issue, as there was no standard. The corner posts should be no higher than 1/16″ as this can pose a risk to your baby by choking. You’ll generally only find cribs with this issue if they were manufactured in the 90’s or earlier, but it’s still something to watch out for. The exception to the rule are cribs that have corners higher than 16 inches to support a canopy; these won’t be a choking hazard. Back in the day, cribs generally came in one of several formats: stationary sides, drop-sides, and drop-gate cribs that fold down. Unfortunately, it turned out that drop-side cribs posed a serious safety risk, and manufacturers are no longer allowed to make these styles of cribs. Again, if you have one of these older cribs that has a drop-side, please don’t use it! It’s just not safe, and you’re much better off just getting a newer one that meets the new safety standards. You can’t find these cribs on sale in stores anymore, but that doesn’t mean you won’t end up with one from eBay, a garage sale, or passed down by friends or family. Has the Crib Been Disassembled? If buying a used crib, it’s ideal to get one that hasn’t been disassembled. The reason is that parts could be missing, or if there are no instructions, there’s no telling whether or not you’ll reassemble it correctly and safely. Also, if it’s in pieces when you buy it, it’s almost impossible to tell if it’s in good condition or not. If you have a crib that you know is unsafe for any particular reason, whether it’s an old drop-side crib or it’s just old and missing parts, the responsible thing to do is to destroy it. When you throw it in the trash, mark on it somewhere that it’s unsafe to use. However, if you have a crib that was recently recalled, you can send it back to the manufacturer for a refund. Most cribs don’t come with a mattress, so don’t forget that you need to get one. Read our guide on choosing the best crib mattress, which will make your job a lot easier. In general, cribs and mattress sizes are standardized, so you shouldn’t have any issue with that. Also, you’ll want to get some good crib sheets to go along with it, and we also have a guide for that!